At any given time, we're building about ten different projects. Here's a sneak peek into five current works in progress. 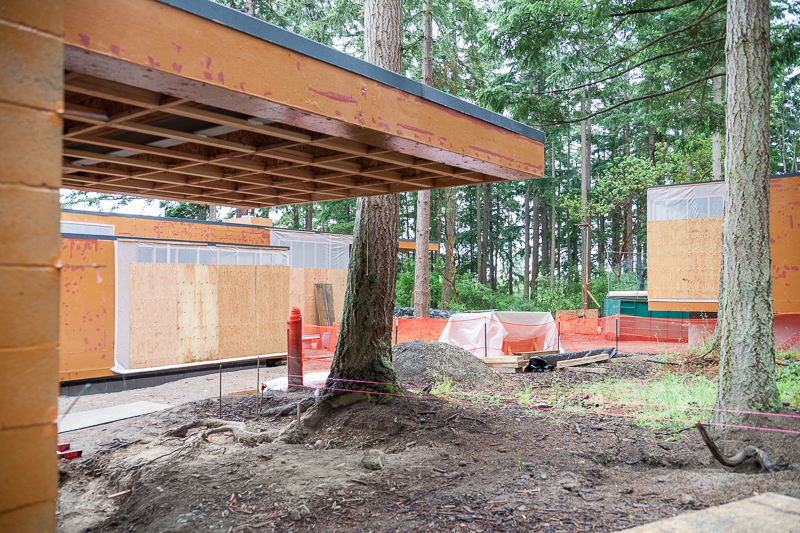 Smuggler's Cove residence on Whidbey Island, designed by MW|Works, under construction. It's busy and exciting at the Smuggler's Cove residence, designed by MW|Works. Inside, rough-in for all the mechanical, electrical, and plumbing is taking place. Outside, we're beginning to enclose the building envelope and preparing to install the window package from Quantum. Notice the Prosoco Wet-Flash on the sheathing, a roll-on, waterproof and breathable barrier that wicks away moisture on the outside while allowing water vapor to escape from the inside. A high-tech, yet green product that was awarded the Declare Label by the Living Future Institute. We began using Prosoco while building a net-zero-energy home, and fell in love with the quality and ease of application. Now we use it on almost every residential project. Above, details of the interior living areas, as well as exterior, where 75% will be covered in windows. The residence consists of several structures that come together at a clearing in the woods, overlooking a pond. Far left: kitchen and living space. Middle left: office area off the master suite. Middle right: lower bedroom with views of the pond. Far right: the massive cantilever, an engineering feat, protects an outdoor patio and the entry-path to the front door. Tavolàta is located at the busy corner of Pike and Summit in Seattle's Capitol Hill neighborhood. Dovetail is thrilled to build chef Ethan Stowell’s latest restaurant, Tavolàta Capitol Hill. Designed by Atelier Drome Architecture, the 2,600-square-foot restaurant is housed on the ground-floor of the new Dunn Automotive building. The team at Atelier Drome designed Tavolàta as a modern Italian eatery with light woods and a pallet of gray hues, creating a warm yet urban feel. “Tavolàta,” is Italian for a large communal table. When entering the restaurant the first big gesture is the table – a 16-foot-long maple slab with live edges. Designed and built in Dovetail’s wood shop in collaboration with Dovetail’s metal shop, the communal table can be separated into two eight-foot-long tables. The tavolàta, in Dovetail's wood shop, before being shipped to the restaurant. Tavolàta Capitol Hill is one of several Ethan Stowell Restaurants that Dovetail has built throughout the years. Dovetail principal, Scott Edwards, says “it’s always such a pleasure working with Ethan because he’s incredibly dedicated to craft and quality, whether it’s food or building materials. As a builder, it’s really special teaming up with him because he cares so much about design and craft. Back exterior: cantilever love at the new View Ridge residence, designed by Heliotrope Architects. How we love the View Ridge residence, let us count the ways. 1: Heliotrope Architects delivered a stunning design. 2: We're crazy about the massive cantilever roof on this house. 3: The cedar doesn't stop at the soffit - it continues inside! 4: Gorgeous custom windows by Quantum - 'nuff said. 5: The clients are really really fabulous! We could go on, but we'll let the rest of the images speak for themselves (kind of). Far left: the stairwell with floating treads. Middle left: the third-floor window walls open up to a porch with views of the entire Cascade Range. Middle right: the cedar soffit appears to seamlessly glide into the living room. Far right: marble, marble, marble in the master bath. Interior third floor of the historic Harvard Exit Theatre, renovation design by S+H Works. What's going on inside the historic Harvard Exit Theatre? Well, we can tell you we're thrilled to be performing the historic preservation and restoration of the entire theatre. It's getting a total make over. We're gutting the theatre down to the studs (meanwhile stripping and preserving all the trim and fancy details), performing seismic and structural upgrades, applying a new roof, adding new mechanical, electrical and plumbing service, restoring windows and installing new ones, and lastly adding an elevator. After all the upgrades are performed we then begin putting the building back together and add the old but newly restored trim and details. Here's a sneak peek at what we've been up to over the last few months. Far left: the roof will be tented while structural upgrades are performed and a new roof is applied. Middle left: the foreman on the job removes an exterior siding panel to reveal the massive old growth beam and column supporting the third-floor theatre. Middle right: the main theatre floor will be leveled. Far right: the newly cut elevator shaft. We're building a new home on Perkins Lane, in Magnolia, designed by Coates Design Architects. We recently demolished the existing home - the retaining wall and parking slab will remain. In its place we're building an entirely new custom home with stunning views of Puget Sound and the Olympics. Stay tuned for progress on this project and more!